As a tattoo collector myself, I know how exciting and engrossing the act of accumulating ink can be. It can become a passion and transform your life in so many ways. Acquiring each new piece from artists whom you admire and respect becomes a journey in itself. Sometimes simple ideas burgeon into huge projects. Case in point, Mr. Jason Cornell. Jason has the passion, a exquisite collection to envy, and is the epitome of one simple piece turning into a sleeve to be reckoned with. 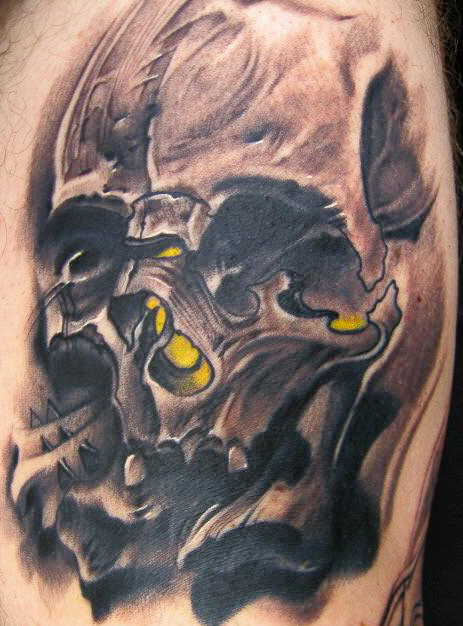 What began with a long-awaited appointment with Mike DeVries, turned into a collection of skull tattoos that has continued to grow at a steady and exciting pace. How’s THAT for a line-up? To make Jason’s story even better, he is one of the most gracious and kind guys I know. He appreciates the art work the he wears tremendously and has such respect for the artists within the industry. Not only that, he is an incredibly talented bass player, who has toured all over the world, playing a diverse range of music genres. I was fortunate enough to get Jason to talk with me about his ingenious tattoo project, his music and his plans for the future. How long have you been interested in tattoos and when did you receive your first piece of ink? I got started relatively late. I was 31 when I got my first tattoo. I really had no interest in tattoos prior to that and would never have seriously considered putting one on my body. At the time, I had been to a couple shops with my friend who was getting inked. That got me thinking more about it. After a few months of contemplating, I was ready. I just needed to decide on what I wanted. Since I played bass guitar, I wanted something that encompassed my instrument. I ended up getting a bass clef surrounded by flames on my arm. You have an incredible project taking place with your skull leg. Can you tell us all about how it got started? Did you set out to collect from so many amazing artists, or did it just begin with one tattoo and grow from there? It actually started with our unborn son. By now I had a few tattoos, but was not a major collector by any means. Our boy was supposed to be smack in the middle of being born a Leo, so I wanted to get a realistic lion cub tattooed on my leg. After doing a lot of research to find someone to tackle the job, I ran across Mike DeVries website and I was sold! Mike was booked out for about a year, so I set up my appointment and waited. Thank goodness I didn’t jump the gun and get the lion tattoo prior to my son being born, because he decided to wait to be a Virgo. I certainly wasn’t getting a virgin tattooed on my leg. 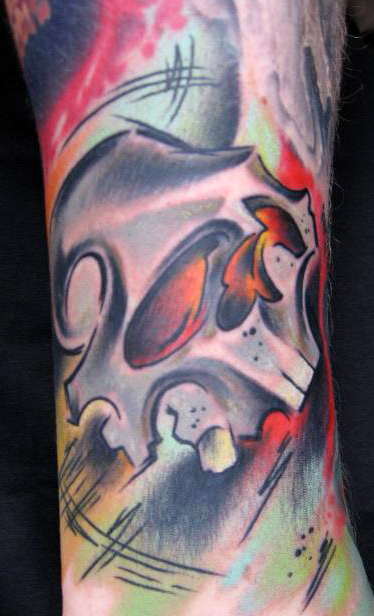 I already had the appointment with Devries, so I thought long and hard and decided on getting a skull. I have always been fascinated with skulls as far back as I can remember. I contacted Mike about the change of plans and the rest is tattoo history (ha ha). 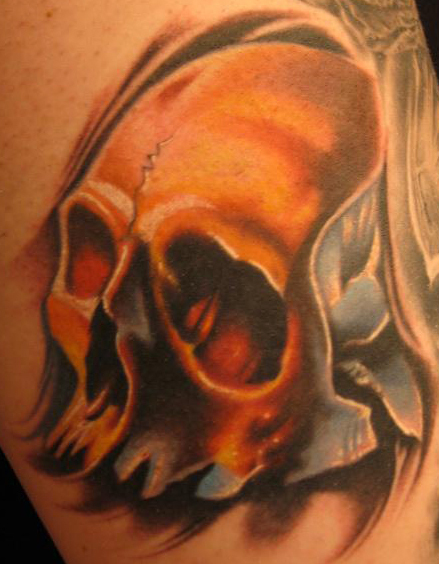 As I mentioned above, your skulls are being tattooed by some of the most talented ink slingers in the world. How do you decide who you wanted to contribute? I wanted to find artists that were not only incredible, but had styles that defined their work. I wanted pieces that someone could look at and know who each artist was. Also I have given each artist complete artistic freedom to do whatever they want. The only specification was that it had to be a skull. It has been such a treat and surprise to see what some of the guys have come up with. Some have done exactly what I expected of them based on their respective styles. Others have taken their pieces in totally different directions from their “norms”. The following (in order) have contributed so far….Mike Devries, Carlos Torres, Jeff Gogue, Nikko Hurtado, Robert Hernandez, Bugs, Jason Butcher, Joshua Carlton, Carlos Rojas, Aric Taylor (aka: The Dark Horse) and Shawn Barber. It has been such an amazing opportunity to collect from some of the best in the world! Everyone has been so cool and excited about the project. It has even become a friendly competition between many of them. They all want to outdo each other, but at the same time have nothing but the highest compliments for the other artists’ pieces. How many more skulls do you plan to add to the sleeve? How many more can fit? And do you which artists you hope to collect from for the rest of the project? I can probably only fit about 4 or 5 more. I pretty much only have the back of my thigh open. Artists that I still want to contribute? That is a hard question to answer because there are so many amazing people out there. Some that are on the “Dream Team List” are Jeff Ensminger, FAT, Victor Portugal, Yang Zhuo and Jess Horiyen. Now that you have such a brilliant sleeve, do you have plans to start another sleeve with similar methods? I have thought about that a lot. 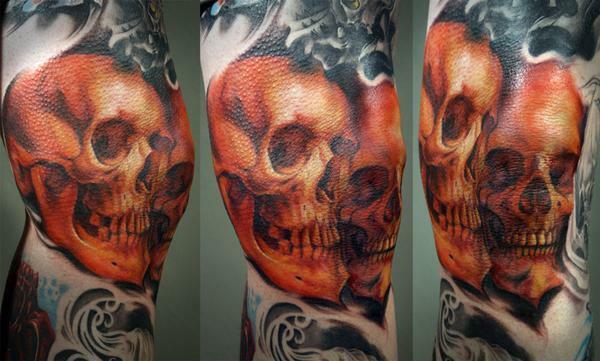 I do love skulls and have thought about continuing the theme with different artists. One of the great things about doing this sleeve is that I am able to see which artists truly fit my personal taste. Should I decide in the future to have just one person work on a project, I will be able to pick out the artist best suited for the next project. The only downside to this adventure has been financial. If I would have chosen to do a sleeve by a single artist, that artist may have been more flexible on price because of the amount of work being given to them. By having all individual artists, there is NO price break! It was worth every penny though and I wouldn’t change anything about this experience! Carlos Rojas has told me a few times “you need to insure that leg.” I think he may be right! You are also a talented musician. Can you tell us about your music, about your band and upcoming gigs? I have been playing the bass guitar for about 20 years. I love it and it will always hold a special place in my life. I have played in many different types of bands over the years….everything from Metal to Jazz and Top 40 to Country. I currently play in a Pat Benatar tribute band. We have been together for 10 years and have had the honor of playing throughout the States, Canada and Japan. It is funny now, because I think back to when I started playing and all I wanted to do was learn everything possible about the bass. I picked up every magazine and researched all I could about the instrument. I feel the same way now, but about tattoos. I want to learn everything I can about the entire culture and history. I just can’t get enough! Right now, I would have to say sick! I have been fighting the flu that has been going around. What's your favorite sweet treat?